On May 10, 2013, after his meeting with the Chairman of the People’s Republic of China, Mr. Xi Jinping, His Holiness Patriarch Kirill of Moscow and All Russia answered questions from Russian and Chinese mass media reporters. As the Primate of the Russian Orthodox Church noted, among the important topics of his meeting was the development of friendship between the Chinese and Russian peoples. ‘The notion of friendship is made up of many factors. It is promoted by mutually beneficial economic cooperation when the sides exchange their resources, trade, maintain scientific and technological cooperation and thus each benefits from this cooperation. Friendship is also promoted by political dialogue, reaching agreement on major global problems and matters of bilateral relations. But if it is all, there will be no friendship. It will be just pragmatic relations. Yet we know that friendship is something more than such relations. Friendship is there where the human heart works, where there is sincere respect and sympathy. Where there is genuine friendship there is security and excellent foundation for the development of cooperation. The Church addresses the human hearts. She believes it her duty to make a real contribution to the strengthening of genuine friendship among our nations’, he said. ‘We spoke about how important it is for each of our nations to see common features in each other’s culture and civilization. If the slogan ‘Russia and China are friends forever and never enemies’ becomes part of culture in both Russia and China, we will reach the goals we have set ourselves’, His Holiness continued, clarifying that religious organizations should play a considerable role in these common efforts. 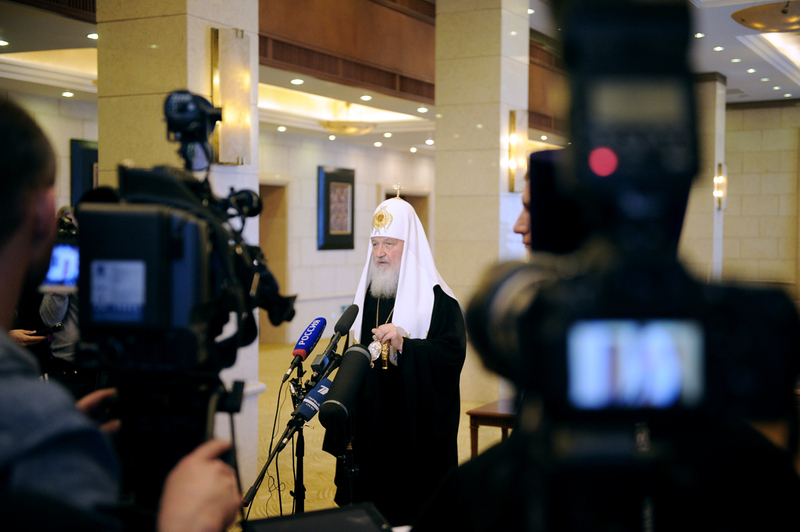 His Holiness also told the journalists that during the meeting with the PCR Chairman they considered the continuation and development of dialogue between the Russian Orthodox Church and religious organizations in China. Mr. Xi Jinping explained to the Primate of the Russian Orthodox Church the religious situation in China and the role played by religious organizations in building the society, showing an example of harmony and solidarity. ‘It is not a simple process, of course, but the state power in China wishes to do all that is possible to promote the building of precisely this kind of harmonious society in which representatives of religions could make their own important contribution’, Patriarch Kirill said in his talk with journalists, ‘We have also given a high value to the results of the dialogue conducted by the Russian Orthodox Church with the Chinese State Administration for Religious Affairs and considered it necessary to continue this work’. His Holiness mentioned another topic dealt with during the meeting, namely, the Chinese Orthodox Church which has existed for over three hundred years now. In the 50s, it was headed by two Chinese hierarchs and the service in it was conducted by dozens of Chinese Orthodox priests. ‘Then the times came of which you are well aware. They reduced the work of the Chinese Orthodox Church to almost the naught. But there are still Chinese believers remaining in China, both ethnic Chinese and scores of thousands of Orthodox people from Russia, Ukraine, Belarus who come to China, some for a short stay while others for a long period of time. I very much hope that as a result of the dialogue conducted by our Church with the State Administration for Religious Affairs, the problems on the agenda will be gradually solved with full respect for the Chinese Constitution and law and reliance on local resources’.